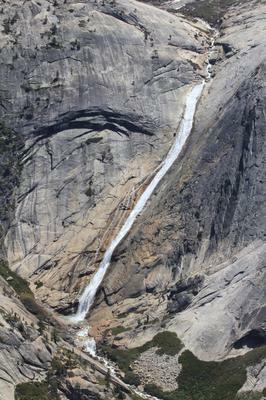 Yep, Pywiack is an elusive falls, tucked in fold in a canyon and viewable from narrow angles. I once did a one day trek from Tenaya Lake to Yosemite Valley. We chose to go when the water was low. The swimming hole at the bottom of Pywiack was just splendid. This hike is not for the timid or the untrained and it’s a case where you need to use judgement and for us we used climbing equipment as well. I’m not sure I would do the Tenaya Canyon hike today. However, with an easier hike along the north rim, fine views of the Pywiack Cascades can be obtained. Look for a point on the north rim just east of Mt. Watkins. But be wary of straying to close to the cliff’s edge.